Rhythm, the UK´s leading magazine for drummers and percussionists, have teamed up with Custom Skins to offer three design-conscious drummers the opportunity to customise their own bass drum head. The first prize winner will also get to watch their design come to life at the Custom Skins HQ in London, UK. 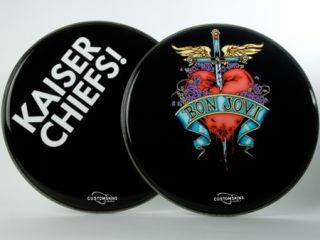 Custom Skins boasts an impressive client list including Kaiser Chiefs, Bon Jovi (both pictured) and Arctic Monkeys to name but a few. To join the list, hand draw your band logo or inspired design on a sheet of A4 paper and send it to Rhythm.